1. Normally suitable for all types of dogs and cats up to 22 lbs. 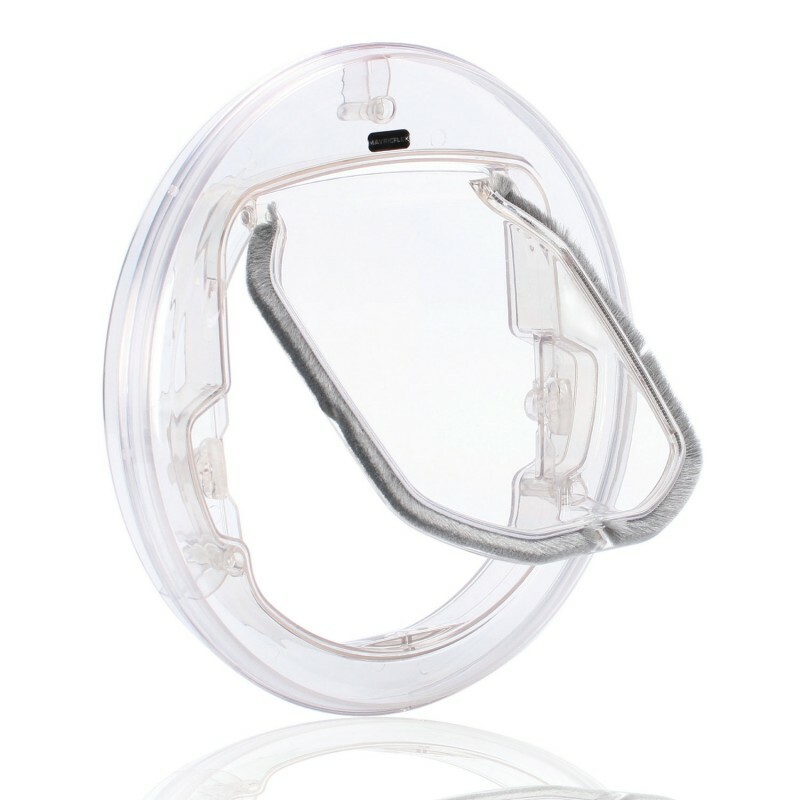 High-end ABS frame with shrinking-resistant flap make sure good safety performance. All of our materials can meet US and EU quality standards. No more worry about security. Dustproof nylon brush, magnetic closure and UV resistant flap ensure weatherproof function.4-way locking system: open, locked, in-only and out-only combines convenience and home security together, you can control the access you want. •Mavric, a professional manufacturer of doggy doors, offers 2 year warranty, any question please contact with us freely. Why you need a pet door? Pets are our best friends and close family. We should have more time to accompany with them and play with them. But we need to work for a long time in our office and we might not lucky enough to find a company that allows us to bring pets working together. When we are not at home, we tend to worry about pets who stay at home alone. Installing an indoor doggie door in your home can allow pets to go out and have fun, we don’t need to worry about them and they can enjoy their outdoor activity as well. Are your pets active at home? If you are not at home, they have no one to play with. They will feel boring as well. A pet screen door in your home can let dog to be dog, they can go out whenever they want. No more boredom and limited exploration. That is good for pets’ mental and physical health. Works like a charm and all our large cats fit with ease. This was the 2nd cat door I have purchased. The first was "Ideal Pet Products 6.25-by-6.25-Inch Lockable Cat Flap with Telescoping Frame" and I wish I had purchased that one again. This unit isn't bad and works as expected. The install is easy enough it just lacks a template that was actual size. The one mine came with was slightly smaller and I had to drawl/cut out my own for the best fit.I would recommend making your own template and taking the door off for cutting/installing. Also note the regular metal blade for the jigsaw isn't long enough to go through both sides of a normal exterior door. Easy to install. Cat's got it figured out. Feels a bit cheap but has held up half a year so far. The problem I ran into was that the door actually sticks open half an inch because of the way the magnetic fields line up if it doesn't swing down hard. This isn't a huge problem for me because it's in my basement door but if you actually had this going outside it would let in cold air. Or more accurately, the cat loves it. Mounted in a metal clad five panel door to the sun room. Fairly easy because the metal was thin. Cutting the foam core was more work. I was a little concerned that this door would not sit flat on a five panel door, and it doesn't, but the gaps are not too evident. Who gets down on the floor to check these out anyway? Our 16 pound cat goes in and out fine, if a little cautiously. When I purchased this product, I was expecting to have to use some wooden shims since I thought this cat door was made for thicker doors. However, I was able to install it in a thin (1/4" thick) panel door without using any wooden spacers. The liner (i.e. the part of the door that would line the inside of the cutout in your door) can be cut down using a box cutter. This makes it so you can put this on doors of varying width. The installation was pretty easy and took me a little less than half an hour from start to finish, including removing the door from it's hinges. I used: box cutter, jig saw, tape measure, and a drill.I am pleased with the look, but not very pleased with how flimsy the locks feel. That said, I'm using this on an interior door and don't plan to lock my cat in her space.